In an idyllic setting high above the city, Henry and Georgiana Burton Pittock built their magnificent family home, completed in 1914. Visitors marvel at the impressive view of mountains and city, the beauty of the carefully crafted details and the innovative features that made it a splendid home, far ahead of its time. Henry Pittock, who had crossed the Oregon Trail in his teens, "barefoot and penniless," soon became owner and publisher of The Oregonian. He was an astute business leader, mountaineer and family man. His wife, Georgiana, also a pioneer, was well known for her lifelong devotion to many charitable causes. Her love for roses led to the establishment of the annual Rose Festival, now a Portland tradition. 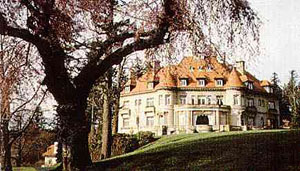 Pittock Mansion is loved by Portland natives and visitors alike. The mansion is an architectural treasure, and lives today as a romantic reminder of a time that will never come again. The grounds provide lovely walks and picnic areas, and those who wish can hike to the mansion from nearby parks. The sweeping views from the mansion and grounds overlook Portland's downtown and Willamette River, leading the eye to Oregon's Mt. Hood and other snowcapped Cascade Range peaks. Pittock Mansion has great views but isn’t much of a castle. It is an excellent example of early 1900’s architecture, though. Growing up in the area, I enjoyed visiting for their annual themed Christmas decorations; my favorite was A Teddy Bear’s Christmas. I agree that this is probably not a castle as I think of one. I will probably remove this listing later. I see your note about someone's objecting to Pittock Mansion (correcty titled) being thought of as a castle. However, I just visited it a couple months ago and it's spectacular. True old world block construction (sandstone), carved stone exterior details. Looks just like the interiors of my picture book called "Castles of the Loire" on the insde - you walk in from the Porta Coche (I know that's spelled wrong!) into plaster created (presumably) block walls, marble floors, a marble double staircase, parquet floors (one small rotunda room to the back patio even has circular parquet pattern!). If you are more interested in gothic and/or medievil castles than romantic, maybe you would think by the exterior it more of a mansion than castle. Seeing it in person, I think it's worthy of "castle" term - by the very bold/strong/fortified exterior block walls, 2 sort of turrets, it's high and private hilltop setting, and interior/exterior finish work you might not be able to get today no matter how much you could pay for it. Admission is $6 per adult I believe and it's just up in the hills a bit west of downtown Portland. Ask any hotel for one of their one fold out page tourist kind of map - lead you right to it.